This is a good old and most popular Indian side dish, made from green mangoes. Mavinakayi is a kannada word used in Karnataka(India) for green mango or unripe mango. The word “chutney” comes from the Sanskrit word catni, which would mean “to lick“. We lick it off our fingers and finish it with a chuckle. I am using jaggery for preparing this recipe, jaggery (concentrated cane sugar) along with a blend of spices, which is used for flavors, taste and texture of the chutney. Normally, green mangoes are available in summer and it is the right time to prepare it. The best part of it is – it can be stored for more than 2 months and it will not get spoiled. If you store it in Refridgerator, it will stay more than 6 months. I am going to show you the easy way of preparing this recipe, at the same time you will have to take care of certain things so that chutney will stand for long time. Choosing of mangoes is one of the most important things. You have to choose fresh mangoes, which are hard in nature and inner part of mangos should be white in colour not yellow. Let’s see the preparation of sweet and sour green mango chutney. Wash and clean green mango (unripe mango). 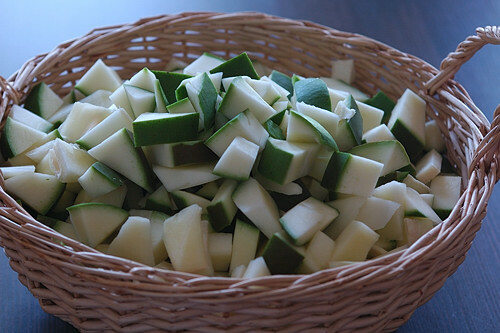 Cut it into small pieces without peeling of the skin and put them in a bowl. The skin of green mango has a lot of fibre and some very useful amino acids in it, which is why the skins of green mangoes are so preferred for pickling in Indian cuisine. They aid in digestion of the spicy foods as well. Place a small frying pan on medium heat, pour fenugreek seeds and roast them to golden brown color, take off the frying pan from heat and add cumin seeds and mustard seeds to it and mix them with the help of a spoon. Allow it to cool down, it may take 5-10 minutes. Make a fine powder of the roasted spices with the help of a mixer and take out from mixer jar and keep it in a small bowl. Take a mixer jar (medium size), pour green mango pieces, jaggary and salt. Grind it coarsely. Leave it to set for 5 minutes. By doing so, the stuff will start leaving water content out so that you need not add water. We are preparing this chutney without adding water so that it will stay long. Remove the lid of mixer jar and add dry coconut powder, red chilly powder and the powder of roasted spices. Grind it to a fine paste. Check the taste of chutney, if you feel of adding salt or jaggary or red chilly powder, you can add accordingly, to your taste and grind it to blend the ingredients added. Take out the stuff to a bowl and close the bowl with lid. Place a small frying pan on medium heat. Pour cooking oil into it, wait until it gets heated. Add mustard seeds, allow them to split, take out the pan from heat and add cumin seeds and hing to it. After two minutes, pour it on the chutney and mix the chutney well so that chutney should absorb all the oil. Sweet and sour Mavina Kayi chutney is ready to serve. It can stored for more than one month. If you store it in Refrigerator, it will stay more than 6 months.